Whether they’re heading to class or going home post-party, more college students are turning to Uber to get where they need to go. While students are often a key audience for Uber, they’re not the only ones concerned about a safe and convenient experience. Colleges and universities have provided on-campus transportation options to ensure that students aren’t walking alone at night nor drinking and driving; and as mobile technology evolves, many campuses are now teaming up with Uber to provide expedient and reliable transportation around the clock. Uber has the same goals as universities: It aims to provide safe and efficient methods for students to get around campus at the touch of a button. Prior to pick-up, students are ensured that they’re riding with a pre-screened driver and can view the drivers license plate, ratings, and vehicle type. During the ride, students’ locations are tracked on a map, and their ETAs can be shared with friends and family. When the ride ends, the safe and secure experience continues. Students pay with cash-free transactions, and they can provide feedback and ratings about their driver. If there’s ever a question after the trip, Uber’s 24/7 support team is there to help as well. 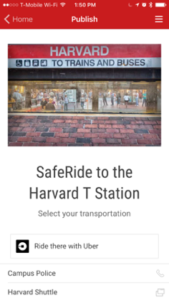 Uber is working with institutions of higher ed to implement Safe Ride Programs, which allows Universities to offer subsidized rides directly to their students. Today, Uber has teamed up with Modo Labs to create a more integrated solution for campuses. Uber and Modo Labs have partnered to enable students to request rides from within their campus apps. With Modo Labs’ Kurogo Publisher Collage screen type, universities can add an Uber ride request to their apps. The administrator has the option to set a pre-established pick-up location or enable the Uber app to geolocate users. Once a ride is requested from the campus app, the Uber app launches with the pick-up location and destination already populated. “Uber is committed to making transportation more affordable and reliable for students in cities and towns around the globe. We are excited to work with Modo to develop innovative solutions that address transportation challenges while making our campuses and communities safer and more accessible, said Chris Taylor, Uber Boston General Manager. Ahead of the official Uber launch in Kurogo Publisher, participants of the Great Mobile Appathon, a mobile hackathon for student non-developers, had the opportunity to build an app on the Modo Labs platform and “test drive” the Uber integration before it went live. 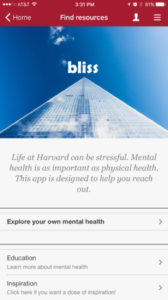 Team Appid Fire, the national winning team from Harvard University, opted to utilize the Uber functionality within their app, bliss, a resource to connect students to mental health resources and destigmatize mental health issues. For students and universities, Uber does more than allow one to “hitch a ride” or crowdsource one’s commute. It’s also about having peace of mind and staying safe on campus.